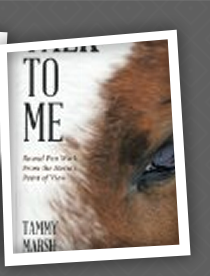 Tammy's book, Talk To Me - Round Pen Work From The Horse's Point of View is about Tammy's journey with her outlaw horse Hugsy, and how learning from each other both were transformed. This is exactly what EAL is and so each EAL program has Talk To Me in the title. A personal growth workshop. Each member of this workshop will come away with personalized insights into themselves and their interactions with people. Each person will identify areas of strengths and areas where growth needs to happen as well as develop a personal plan to achieve those goals. Half day workshop $50 Full day workshop $100 per participant. Check our events page for workshops or contact us to set up an event. A team building workshop. This workshop is appropriate for corporate teams, sports teams, school clubs, Boy Scouts, Girl Scouts, any group that wants to learn the skills needed to work as a team. A few of the outcomes include: Identifying ways to maximize team performance, reveal and improve organizational barriers to communication, enhance team work skills, provide insight into group dynamics, strengthen relationships for better collaboration, develop action items to implement back in the team environment. E-mail Palomino Acres to set up a Game Day workshop. A leadership workshop. This workshop is designed for people who are in a leadership role or who want to advance to a leadership role. What strengths do you have as a leader? How do you enhance those strengths? What are your weaknesses? How do you manage those weaknesses? A few of the outcomes include: identifying ways to maximize team performance, promote and facilitate successful change within an organization, reveal and improve organizational barriers to communication, enhance leadership skills, provide a motivational learning environment, examine cultural expectations and how they impact results, improve creative problem solving abilities. This workshop is appropriate for corporate as well as school groups such as student council. E-mail Palomino Acres to set up an On Point workshop. A couples workshop. This workshop is designed for couples that want to strengthen their bond as well as for couples that are having trouble and want help to mend their relationship. In this workshop we will identify the strengths of the relationship as well as the challenges and obstacles. We will clarify beliefs that work for the couple and those that are holding the couple back. The couple will leave with an understanding of which behaviors and attitudes lead to the best results in the relationship as well as identifying changes and next steps to achieve a better relationship. Half Day workshop $75, Full day workshop $150 per couple. Check our events page for workshops or contact us to set up a workshop. Individual Sessions: Any of the workshops can be done in private sessions. Any issue can be addressed in an individual EAL session. If you need help with self-confidence, managing stress, communication, prioritizing things in your life and individual session can help. These sessions are appropriate for all ages. E-mail to set up a session. Horse Intervention Program. Programs individually designed for at- risk youth. After school and vacation programs are in development. Activities will focus on teaching life skills and character education. 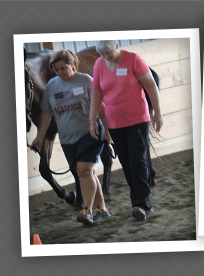 Tammy will work with your horse in the round pen while Shari performs animal communication in the same format as Talk To Me. Tammy will also work with you and your horse in the round pen. 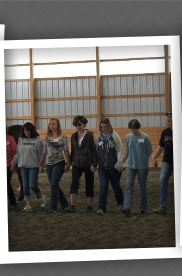 Shari will get specific feedback from your horse on how you can improve your relationship and training with your horse. Tammy will provide you with exercises to work on at home on any issue you identify. The exercises can be done with or without the use of a round pen. 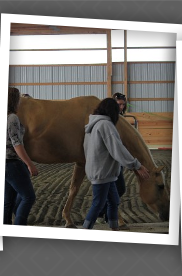 Shari will perform Animal Communication with any questions you have for your horse. You will receive your own typed chapter of the experience in the same format as in Talk To Me with possible publication in Talk To Me Too. $200 per session. E-mail to set up a session. We also offer horsemanship lessons. 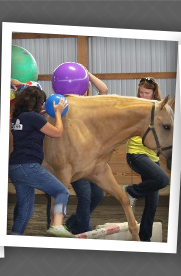 These lessons include riding but also cover all aspects of horse care, ground work, and riding. All lessons are private. Tammy specializes in adult beginners who's dream has always been to learn to ride but all ages and abilities are welcome. If you own a horse and would like lessons on your own horse you are welcome to trailer in to Palomino Acres. Tammy will also travel locally. $30 per hour session. E-mail to set up a lesson. Tammy is a Reiki Master specializing in horses but appointments can be made for other 4-legged members of the family as well as humans. Reiki is a Japanese healing art based on the belief that the Universal Life Energy or "ki" (Chi in traditional Chinese Medicine) flows within the physical body through pathways known as Chakras and Meridians. Chakras are energy centers through wihich life force energy is drawn into a physical being. Each Chakra is responsible for certain physical systems, glands, organs, emotions, and mental attitudes. Once energy has been absorbed into the body it is then distributed through the body via Merdians much in the same way as blood flows around the circulatory system. If either the Chakras or Meridians become blocked throgh either emotional or physical disturbance, the energy flow becomes sluggish or stagnant resulting in emotional and/or physical dis-ease. When you ride your horse your base chakra (grounding) connects with the horse's solar plexus (power). The horse's energy and the riders energy effect each other. It is also possible the Chakras may shut down and become constricted from ill-fitting tack, environmental influences or the horse human interaction. During a Reiki session the practicioner acts as a channel focusing the energy "Ki" into the recipients body allowing a rebalancing and harmonization of the Chakras. This will enhance the body's natural ability to heal both physicall and mentally, encouraging optimum health, well-being and performance. What happens at an Equine Reiki Session? I do a Reiki session wherever your horse is comfortable. I prefer to have the horse free in a stall or round pen so they can move away from and into the energy as they need to. When I arrive I will ask you for a brief history of your horse and if you have any particular reason for calling me. I am not a Veterinarian. Reiki can be used in conjunction with regular Veterinary care to improve th healing of your horse. Reiki can also be used to maintain a horse's health and well-being. Reiki is not a substitute for regular Veterinary care. The length of each session is determied by the needs of the horse. I will begin each session by offering the energy to the horse in a non-threatening way. This allows the horse to get use to the energy and allows them time to adjust to me. When they are comfortable I will perform a scan to indicate any problem areas. I will place my hands over different areas of the body, concentrating on the horse's energy centers and anywhere we feel the horse wants me to go, giving extra attention to the areas the scan indicated were an issue for the horse. During the session you may notice the horse licking and chewing, twitching muscles, sighing and pawing the ground. Often you will notice their eyes soften, their lips droop and some horses fall asleep. These are signs that the horse is accepting and using the energy. Following the Reiki session the horse should have access to plenty of fresh water. They are often very thirsty after Reiki as toxins are expelled from their system.